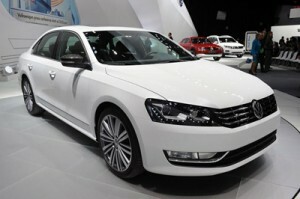 As part of its 2013 Detroit Auto Show debut package, Volkswagen has rolled out a sportier version of the Passat sedan, though it’s strictly conceptual for now. A small dose of go-fast visuals have been added to the handsome Volkswagen, including 19-inch wheels, carbon-capped mirrors, an advanced front lighting system, LED tail lamps and dual exhaust. Some carbon bits and upgraded leather are found inside the cabin, as well. But the real performance chops come in the form of a 1.8-liter turbocharged four-cylinder engine that sends 250 horsepower to the Passat’s front wheels via a six-speed automatic transmission. That’s a good boost in power over the 170 hp of the base 2.5-liter inline-five, but not quite as potent as the 3.6-liter VR6. A lowered sport suspension and revised electronic steering are also on hand, making things slightly more involving out on the road… we assume.